Shirley at the 5th belay on Hypotenuse with the Pixari in the background. Our time in the Dolomites ended all too quickly – we still had so many ideas on our list… But it was time for some warm and sunny (so we hoped) cragging. 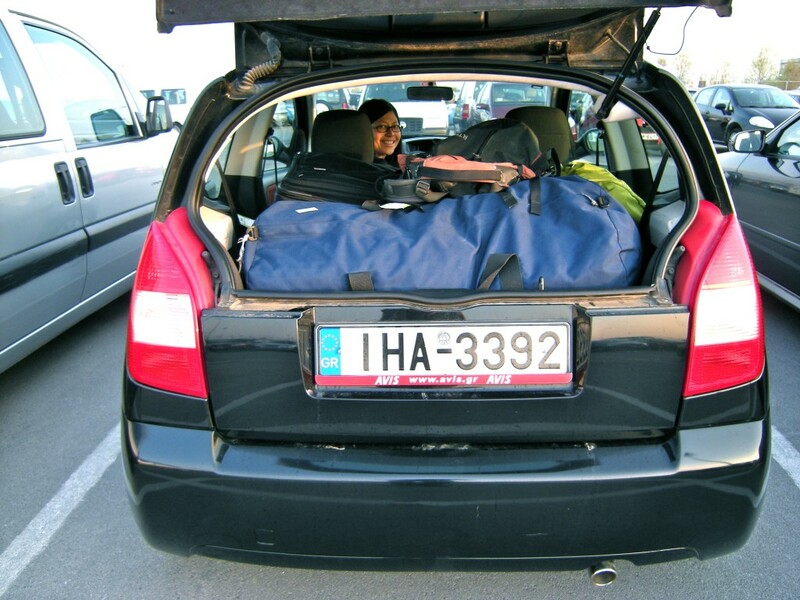 We drove back to Venice and caught a flight to Thessaloniki via Zurich. Arrived in Thessalonki at 2am and slept in the airport terminal till the car rental place opened up at 8am. 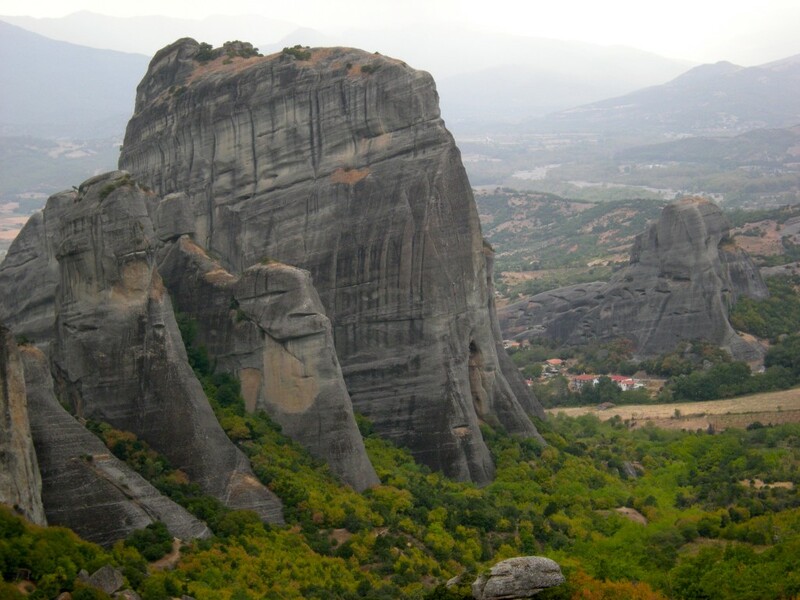 After that it was a quick drive to Kastraki and the famous Meteora. The scenery is out of this world – countless towers directly above the village and some of them sport monasteries on their summits. The rock looks like granite from afar but of course is not. A curious conglomerate – smooth rocks (ranging from thumbnail- to TV-sized) embedded in something resembling concrete. Stuff seems quite solid for the most part as we’d find out later. Out of our motel window we could see some of our objectives and were itching to get started in this new playground. We spent the afternoon walking around the village of Kastraki and the next-door (touristy) Kalambaka. 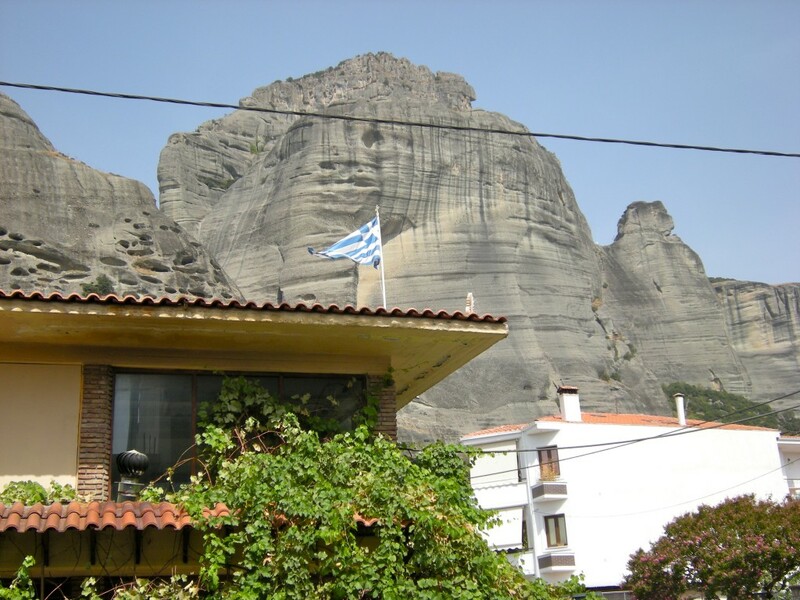 We immersed ourselves in the local culture over a large taverna dinner (tzatziki, Greek salad, Alpha beer, and much souvlaki) and bled many Euros on the two-volume Meteora climbing guide book. 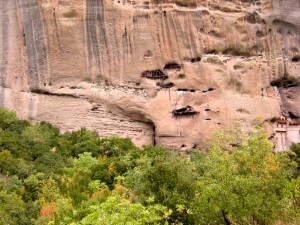 Monk hermitages on Pixari. 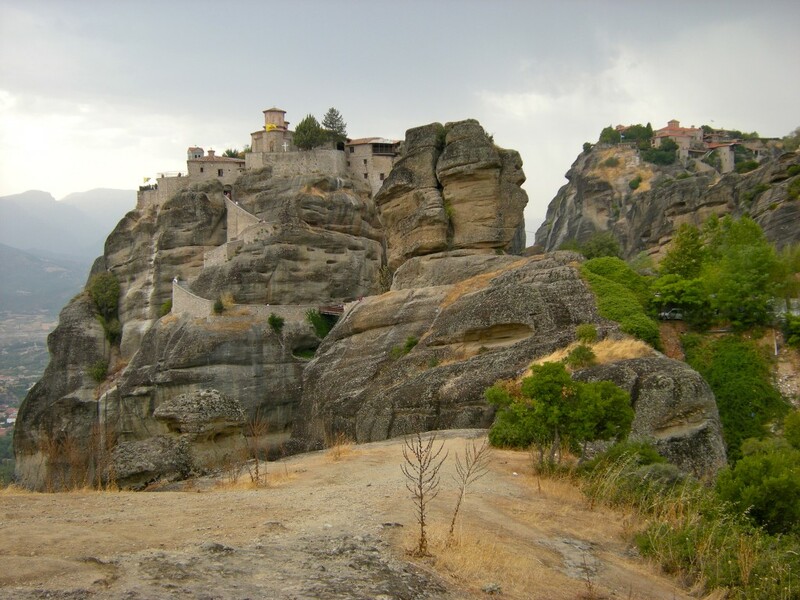 A functioning monastery built into the rockface is on the right. 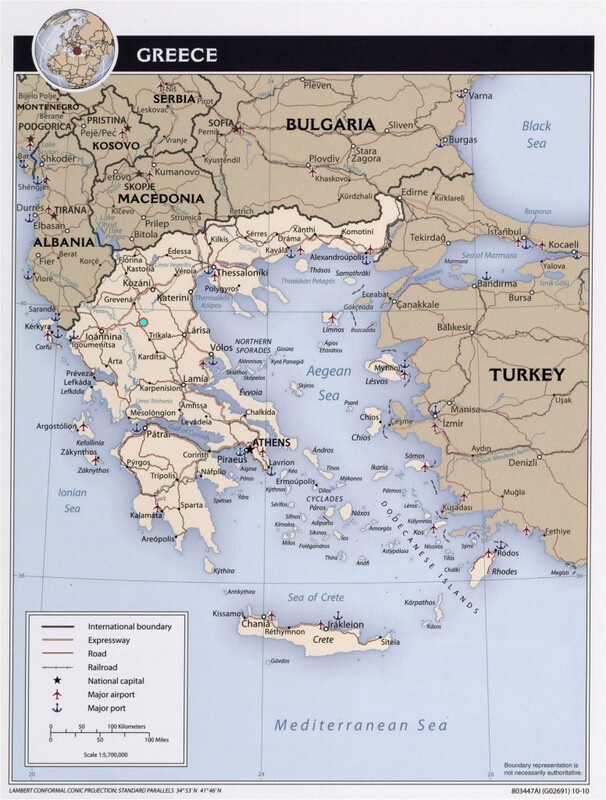 Location of Meteora within Greece. Public domain map courtesy of CIA World Factbook. 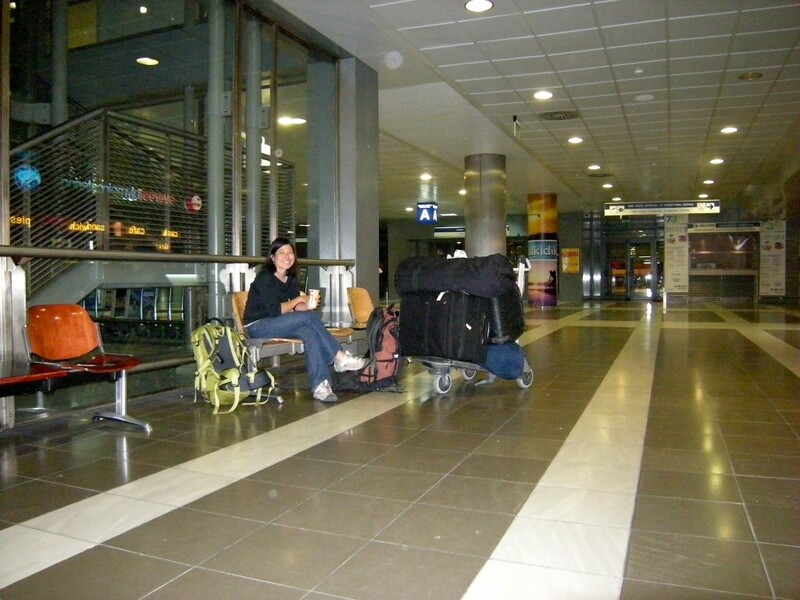 Shirley camping out in Thessaloniki's airport. Our flight was to reach Thessaloniki at 1am. It got there at 2am and the conveyer belt took some time to deliver our bags and then there was the issue of the car rental place opening up at 8am (Sept. 2008). Shirley and her new ride at the Thessaloniki airport...finally picked up our rental car in the morning for the drive to Meteora (Sept. 2008). 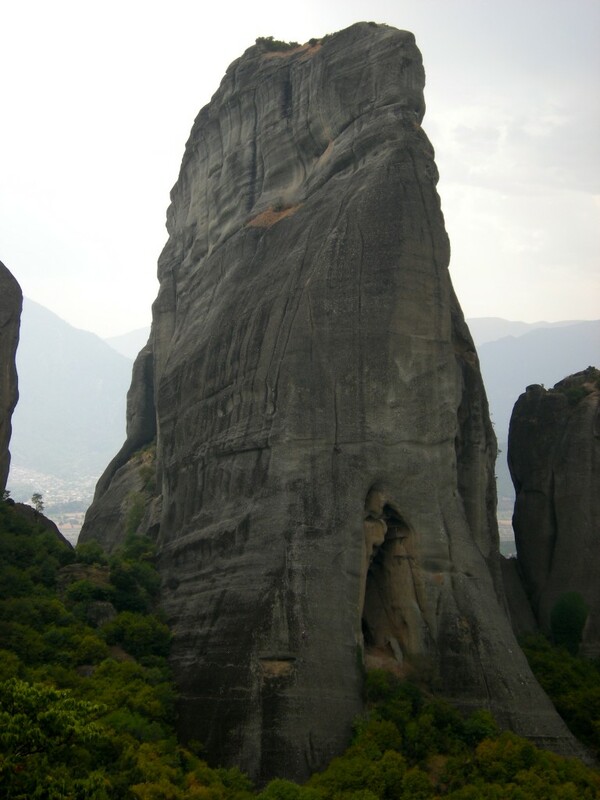 The conglomerate formations of Meteora towering over the town of Kalambaka (Sept. 2008). 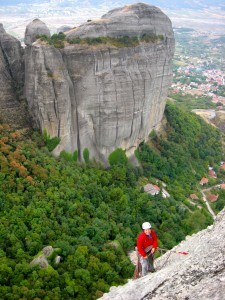 View of some of the larger formations of Meteora. On the right is Doupianifels formation. Holy Ghost is the largest formation in the shot (with climbers scattered on the Pillar Of Dreams route). The small formation at the foot of Holy Ghost is (probably) the Kumariesturm (Sept. 2008). 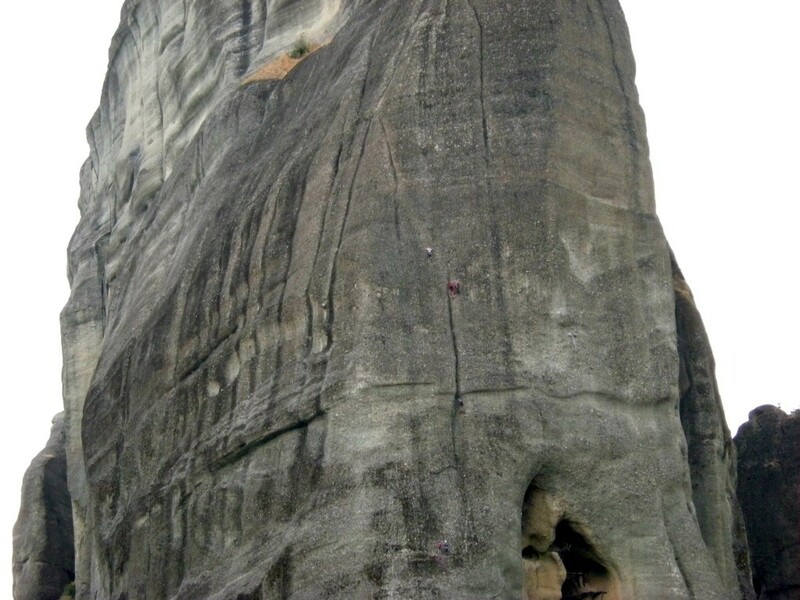 Climbers scattered on the Traumpfeiler route (Pillar Of Dreams) on the Heiliger Geist (Holy Ghost) formation (Sept. 2008). Close up of the same multiple parties spread all over the Traumpfeiler route (top of P2, P3, and P4; August 2008). Moni Megalou Meteorou (or the Grand Meteora Monastery) - a 14th century construct & the highest one of all the Meteora monasteries (Sept. 2008). 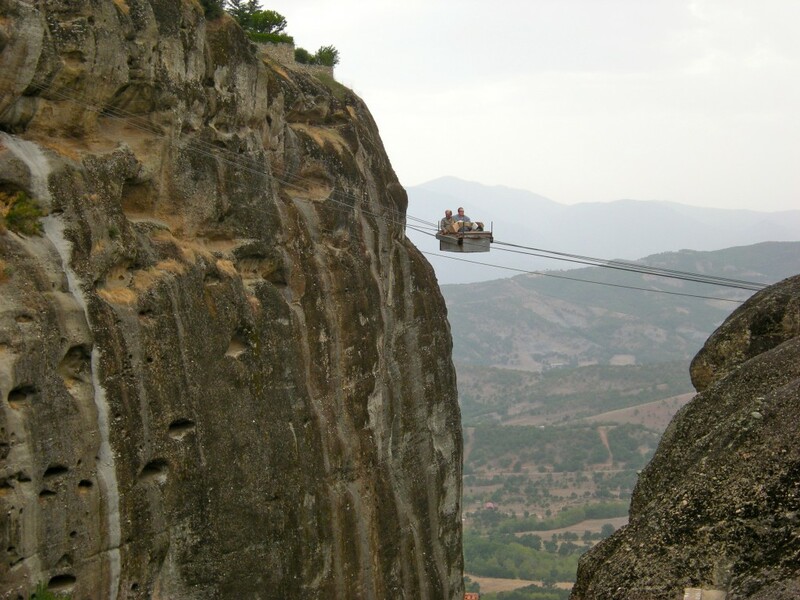 Couple of monks making their way to the their parked Mercedes sedans from the Grand Meteora Monastery (Sept. 2008).